With all the preserving going on in our house, there hasn’t been much time for cooking anything else. It has been a matter of “what shall we have with our cucumbers and tomatoes tonight?” But there are other things in our fridge. In particular, we had some Blue Castello that I bought to have with cumquats in syrup. Sally Wise, in her book, Out of the Bottle, advises that preserved cumquats taste wonderful with blue cheese. I made her recipe for preserved cumquats, on page 167, but never got around to eating them with the blue cheese. I think I was going to have it over the Christmas celebrations. As the blue cheese was getting close to its ‘use by date’, it was time to act. Fry the bacon in a pan until the fat begins to melt. Add the walnuts and fry until the bacon is crisp. Set aside. Cook the broccoli in boiling water until it is cooked but still crisp. Drain the broccoli and put into the pan in which the bacon was cooked. Cook the penne in boiling water until al dente. Drain the penne and add to the broccoli. Stir in the cream and cheese. Heat gently until the cheese has melted and combined with cream (don’t let the cream boil). Toss in the bacon and walnuts. This entry was posted in Broccoli, Eating your bounty, Pasta and Rice, Something Simple, What's for dinner? 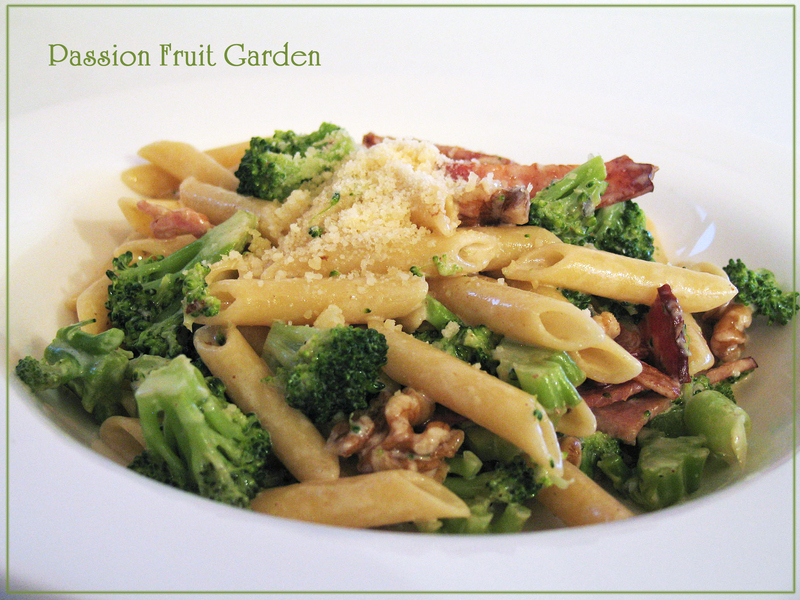 and tagged Broccoli with pasta by Glenda. Bookmark the permalink. Blue cheese, walnuts and bacon are my 3 favorite foods…yummy combo. Hi Connie, a combination made in heaven. Love this, Glenda. It has all of the major food groups: bacon, cheese, pasta, and heavy cream — with something green to make it healthy. This dish is perfection! And your vegetarian friends have also enjoyed this dish. Even without the bacon it’s still very tasty ! !